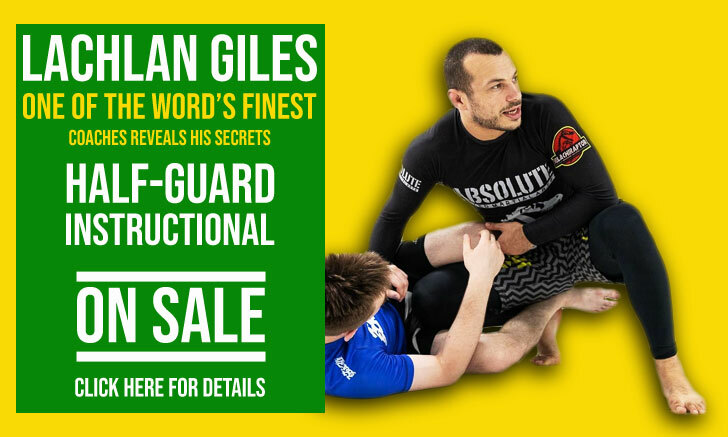 The darce choke (or d’arce), also called ‘no gi brabo choke’ (not to confuse with the standard brabo choke), in Portuguese often called triângulo de braço invertido or even triângulo de mão, is a choke used in Brazilian Jiu Jitsu, MMA and other grappling sports which is a variation of the katagatame (arm triangle) and the anaconda chokes. The difference between the darce and the anaconda choke lies on the positioning of the ‘lock’, which ultimately defines the way the pressure should be exerted. The darce choke is applied by wrapping both arms around the opponent’s neck, leaving one arm inside and another one outside this hold. The name ‘darce’ derives from an American grappler by the name of Joe D’arce, famed for his use of the choke, though the actual choke may have originated in Germany, created by a luta livre esportiva competitor called Björn Dag Lagerström. 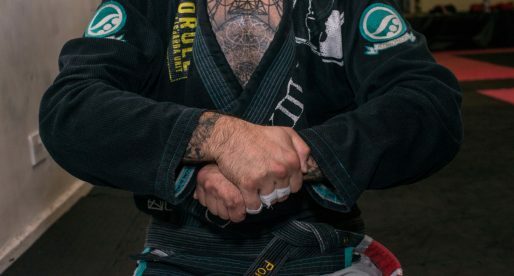 As per usual, we would like to explain that grappling is an ancient art form, and as such many positions and techniques MAY have existed prior to these, more recent, (re) discoveries of positions. That said, the brabo choke became famous in Jiu Jitsu by the hands (or arms rather) of a black belt named Milton Vieira. Milton learnt most of his grappling skills through Jefferson “Jop” Pereira, a luta livre coach who (according to Milton) taught a very Jitsu oriented grappling style. Vieira eventually moved on to MMA joining the famous Brazilian Top Team (BTT), one of the top Mixed Martial Arts teams in the early early/mid 2000’s, to further develop his skills. BTT was led by Zé Mario Sperry, Murilo Bustamante, Ricardo Libório and ‘Bebeo’ Duarte, all well known Jiu Jitsu fighters, and Milton Vieira’s slick submission orientated game fitted perfectly in the philosophy of the group. Milton brought several grappling positions to the team, specially his signature ‘anaconda’ and the now called darce chokes which were picked up with great interest by some of the team’s top fighters, including Rodrigo ‘Minotauro’ Nogueira. Minotauro was the superstar of the team, who at the time was ranked as the number 2 heavyweight in the world. Rodrigo learnt Vieira’s chokes and was very successful at the highest level of MMA competition utilizing these same techniques which raised the awareness of Jiu Jitsu’s mainstream competitors to these moves. the ‘triângulo de braço invertido’ the move with which the athlete Milton Vieira submitted Cro-Cop (E.N. :Bruno Lobato) at Bitteti Combat was developed in the late 1990’s in Germany by a student of mine of Norwegian origin, while I was coaching there. 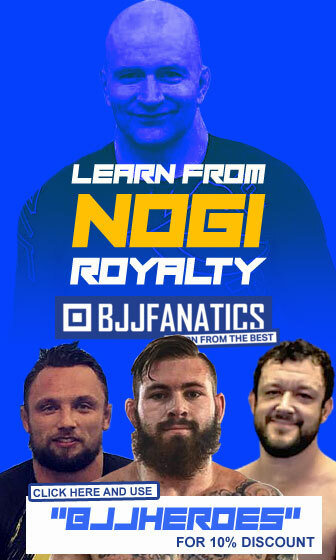 The norwegian student that Mr D’Dane mentions was Björn Dag Lagerström who created the position, by accident, after Daniel taught him the anaconda choke, Björn would use this position in 1996 for the first time in competition at a german submission grappling tournament named “TAP” (Torneio Pega-Onça) where he submitted 3 opponents with this new choke. Daniel D’Dane would return to Brazil in 2001, where he taught the position to his Brazilian team mates at the RFT (Renovação Fight Team) where the famous Alexandre Pequeno trained. Pequeno would also be important in the development and raise awareness to the choke among his luta livre peers who later passed the position to Milton. Joe D’arce was a well known competitor in grappling tournaments of the mid 2000’s. 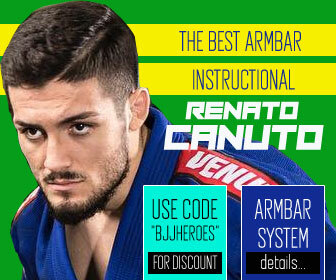 A representative of Renzo Gracie and his New York jiu jitsu academy, D’arce learnt the technique from RGA’s coach, John Danaher. Having won several fights making better use of the choke, D’arce caught the eye of another American grappler named Marc Laimon. 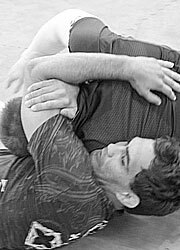 Laimon labelled the technique “the darce choke”, and being a very well respected grappling coach in USA’s west coast, the name started being mentioned in the area to define the position. 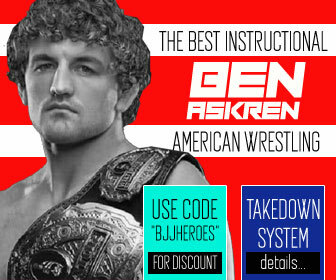 With the growing popularity of Jiu Jitsu in the west coast, darce became the more common name for this technique. I’ve heard this called the “Shaolin” various people as well. hi, my Name is Björn Dag Lagerström, and I am the inventor of this move (we call it Björn Technik or bear choke). I am a norwegian Luta livreblack Belt under Daniel D Dane. The name he talks about is not Schneckenberger but Björn dag Lagerström.